IBM Crypto-Anchor Verifier, an AI-enabled scanner for visual clues that prove an item’s authenticity. Today IBM Research is introducing IBM Crypto Anchor Verifier, a new technology that brings innovations in AI and optical imaging together to help prove the identity and authenticity of objects. We're rolling this technology out with one of our first clients, GIA (Gemological Institute of America), to help them evaluate and grade diamonds. The objects and substances that we buy, wear, eat or use every day all have their own unique optical patterns, sometimes undetectable by the human eye, that differentiate them from each other. These patterns can distinguish an organic ear of corn from a genetically modified one, or identify impurities in diamonds, for example. Optical characteristics can be measured using light spectrometers, an instrument used to measure properties of light, but they are quite bulky and expensive, limiting their utility. Use of optical analytics for object identification in real-world circumstances demands a more adaptable tool. IBM Research recently developed a powerful, portable optical analyzer, small enough to use with a cell phone camera. AI and machine learning techniques including neural networks and video analytics play an important role in recognizing the optical characteristics of a substance, liquid or object including its color, motion, viscosity and hue saturation. Models are trained with this data so they can predict the material or constituents of a substance they're presented with. This innovative technology is a natural partner to blockchain technology, an immutable digital ledger that records transactions in a public or private peer-to-peer network. Interest in using blockchain to track physical goods is growing rapidly. IBM's Crypto Anchor Verifier solution can be used to capture the optical signature from an original, uncompromised item and subsequently record it on the blockchain, which can verify throughout the supply chain that the item hasn't been tampered with. As an example, IBM Crypto Anchor Verifier can be used via the blockchain to track a crate of wine from the time a vintner starts the distribution process to the moment a collector buys it, to confirm it's the same wine that left the vineyard. By collaborating with GIA, we're taking this research outside of the lab and into a real-world setting. GIA is recognized as the inventor of the famous 4Cs of diamond quality—Cut, Color, Clarity, and Carat Weight—and the International Diamond Grading System recognized globally as the standard for diamond quality. The Institute is dedicated to ensuring public trust in gems and jewelry through its pursuit of research, education and standards-based gem identification and grading services. GIA is currently testing the Verifier software to apply this exciting innovation to diamond grading by capturing and creating 3-D model images of diamonds, analyzing their characteristics and predicting their clarity grade. Today, AI models trained to predict a diamond's grade have performed with accuracy levels (within one grade) of more than 90 percent in the developmental phase using 2-D images. This builds on GIA's previous research using images to evaluate diamonds. GIA's engagement with IBM Research includes the co-design of an imaging system that will embed the optical lens into GIA's grading process before this solution goes into production. During this multi-year engagement, we plan to release new and enhanced services. In the future, GIA will explore expanding access to this grading capability to retailers as part of their mission to protect consumers and ensure they trust in diamonds. 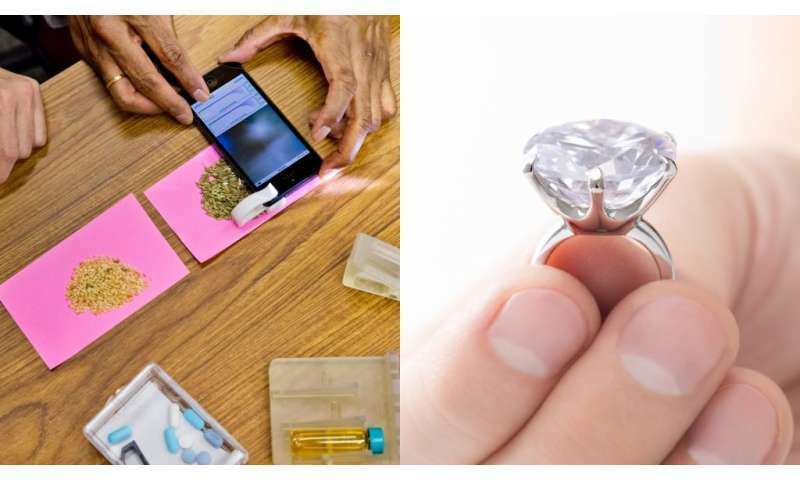 This could take the form of retailer applications that allow individuals to verify a diamond's grade and authenticity to provide further confidence for the consumer and protect the integrity of GIA reports. Imagine using the Verifier technology on your cell phone to confirm that the grade of a diamond you purchased is the same grade given by GIA, or to make sure the same diamond is returned to you when you have it cleaned by a third party. GIA also hopes to integrate this solution to the blockchain by creating and adding records on diamonds that ensure transparency and verifiability for the gems throughout their journey from manufacturer to consumer. We think the opportunities for the Crypto Anchor Verifier are limitless and offer a viable way to protect and validate all kinds of physical substances and, combined with the blockchain, bring new levels of trust to business transactions. What would you use it for? Explainer: Why are crypto exchanges vulnerable to hacks?